Significant extensions and discoveries by the 50 largest U.S. oil and gas companies (see note 1) are responsible for a 21% increase in oil reserves in 2017, according to EY’s latest U.S. oil and gas reserves and production study, which can be downloaded here. The study was built using raw data extracted from Evaluate Energy. For a demonstration of Evaluate Energy’s financial and operating database, please click here. 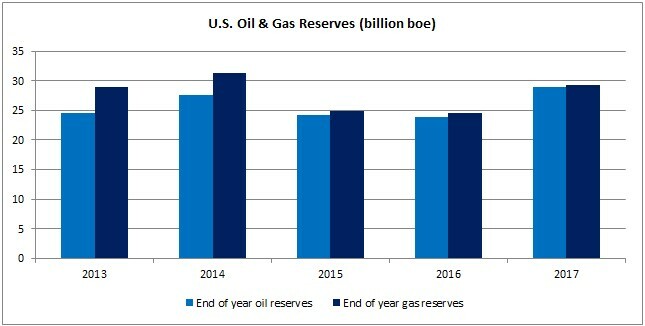 Source: Chart created using data published for 50 U.S. oil and gas companies in EY’s U.S. oil and gas reserves and production study for 2018. 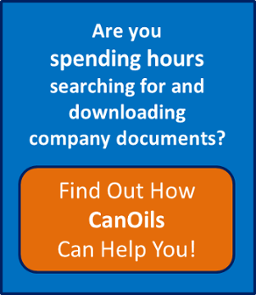 “Oil reserves for the study companies increased 21 per cent in 2017 due to significant extensions and discoveries, net upward revisions and purchases partially offset by production and sales. As a result, the study companies reported the highest oil reserves for the five-year study period,” the report said. Extensions and discoveries increased by 76% in 2017 from 2016 and, at five billion barrels, were the highest of the study period (2013-2017) following the lowest level reported last year. End-of-year gas reserves for the study companies increased 19% in 2017 to 176 tcf, marking the highest level of gas reserves since 2014. “The increase is mainly due to extensions and discoveries, upward revisions and purchases, partially offset by sales of proved gas reserves and production,” the report noted. 1) The 50 companies are the 50 largest in the U.S. based on 2017 end-of-year oil and gas reserve estimates. The study companies cover approximately 44% of the US combined oil and gas production for 2017.